Schaumburg police arrested two Chicago-area men Thursday after they attempted to sell undercover officers 100 pills of ecstasy in exchange for $1,000. Police charged Anthony Torres, 20, of Chicago Ridge, and James Winters, 30, of Tinley Park, with delivery of a controlled substance near Golf Road and Roselle Road, according to Assistant State’s Attorney Adam Klugman. Bond was set at $80,000 for Torres and $100,000 for Winters by Cook County Judge Joseph Urso. The Class X felony, the men could face six to 30 years in prison. Torres and Winters are due to appear in court June 19. Approximate location of drug bust Thursday in Schaumburg. Last September, two Schiller Park men were arrested at the Streets of Woodfield shopping center in the 600 block of Martingale Road after two informants arranged to buy 100 ecstasy pills for $1000. Emil Raytchev, 19, of the 3800 block of Ivanhoe Court and Hristo Svirkov, 21, of the 3800 block of 25th Avenue were charged Wednesday night (September 3, 2008) with possession with intent to deliver within 1,000 yards of a park, since the location was near Busse Woods — Cook County’s Ned Brown Forest Preserve. Emil Raytchev is serving time as inmate at Hill Correctional Center. Imprisoned since January 2, 2009, his projected parole date is June 22, 2011. Hristo Svirkov was sentenced to 30 months probation. What do ecstasy pills look like? Ecstasy photo from the United States Department of Justice. What does ecstasy look like? 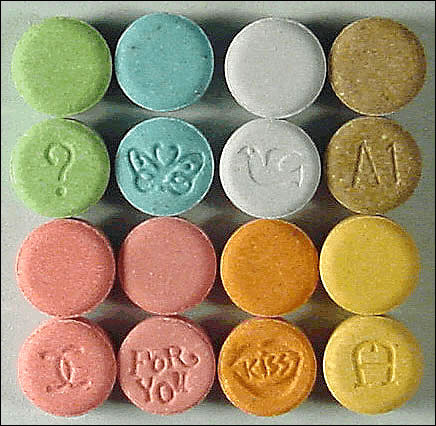 Some ecstasy is delivered in colored pills with candy-like monogram label as shown above. It is also available in a brownish-gray crystal powder form that looks a little like crude brown sugar.